The primary function of tongue is to help us in chewing the food. It helps in mixing the food we eat with saliva thus helps in the process of digestion. However, tongue can trap some food particles that appear in the form of white and slime coat. Bacteria easily dwells in this coating. There are more than lakhs of micro organisms that reside on our tongue and can cause foul smell and bad breath. The tongue should be cleaned everyday to avoid foul smell and bad breath. As the bacteria on the tongue causes bad breath, you will feel embarrassed while talking to your friends and relatives. To feel confident while talking it is a good practice to clean the tongue for fresh breath and enjoy the food. Fresh breath: Cleaning of tongue removes food particles, bacteria and dead cells that will help in promoting fresh breath. Many people clean their tongue using the toothbrush that is not effective as tongue cleaners. Better to use a tongue cleaner to remove the slime coat from the surface of the tongue. Tasting of flavours becomes more effective: You will not be able to taste the flavours of the food if your tongue is left unclean for a long time. Clean tongue helps you enjoy the food and relish it. How to choose a tongue cleaner? 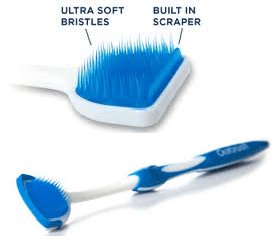 A brush or scrapper? Both are effective in cleaning the tongue. Choose the one that is comfortable for you to clean. When choosing a tongue cleaner, you need to keep in mind certain things, like if you are choosing for you children, make sure the scraper is small in size and for adults, it is better to choose a wider and a bigger scrapper. While choosing a tongue cleaner, consider the durability of the material. Some tongue cleaners are made of plastic, copper and stainless steel. Stainless steel scrapers should be sterilized before use. Plastic tongue cleaners doesn’t need sterilization, but should be cleaned with antibacterial soap. Many tongue cleaners are available with special features which make them look more attractive. Don’t go for the looks, be practical while choosing. How to use a tongue cleaner? Hold the tongue scrapper in your hand tightly, then start scrapping from the back of the tongue pulling towards the tip of your tongue. Now wash the scrapper and again repeat it in the same way until your tongue is cleaned completely. After cleaning your tongue, wash your tongue cleaner thoroughly and store it in a dry place. Rinse your mouth with water or you can use a mouth wash that will make you breath more fresh. When using tongue cleaner for the first time, some gagging might occur. But you will get used to it when using regularly. This entry was posted on Friday, October 18th, 2013 at 6:20 am	and is filed under Dental Health. You can follow any responses to this entry through the RSS 2.0 feed. You can skip to the end and leave a response. Pinging is currently not allowed.